Jackson, Miss. – The Jackson State football team hoped to redeem itself against Southern after suffering a home loss against North Alabama. The Tigers’ offense struggled against the Lions and JSU’s secondary gave up huge chunks of yards in the passing game in the loss. 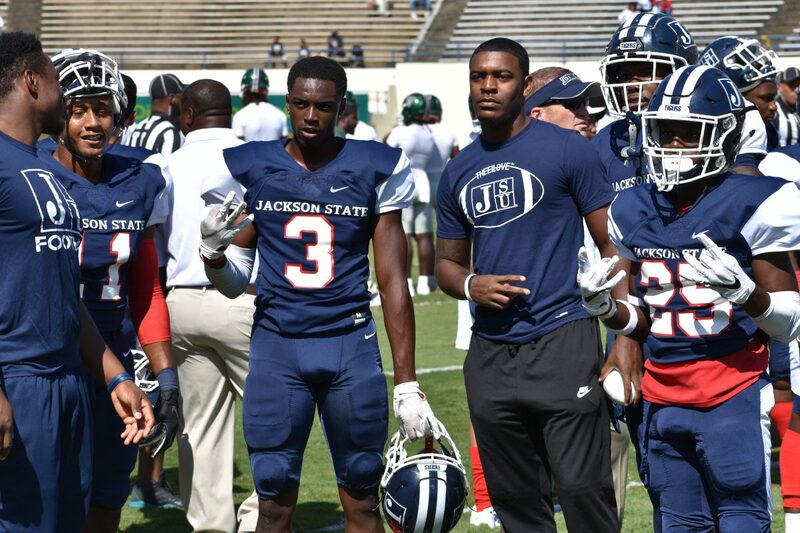 Against Southern in the 2018 BoomBox Classic, things went from bad to really bad for Jackson State in a matter of four quarters and less than 24 hours. In the Jaguars 41-7 massacre over the Tigers, Jackson State surrendered 259 yards of total offense to Southern, with 198 coming on the ground. The Tigers entered the game ranked second in the SWAC against conference opponents in rush defense, giving up 99.7 yards on the ground. Needless to say, Jaguars quarterback Ladarius Skelton had his way with the Tigers’ defense, rushing for 98 yards on 13 carries and throwing for 61 yards and a touchdown. Beyond Skelton’s performance, Jackson State never got it going and struggled in all phases of the game. Southern’s defense forced two fumbles that were returned for two touchdowns, and Jaguars kicker Martell Fontenot notched critical field goals to keep pouring points on the Tigers. JSU’s rushing attack – one that averaged nearly 160 yards per game (fifth best in the SWAC) before playing the Jaguars – was held to only 32 yards on the ground and a total of 229 yards of total offense. Even worse, the Tigers only moved the ball in Southern’s territory three times during the game and held an average field position from their own 22-yard line. Despite high hopes entering the game, Southern “Protected the Bluff” while JSU’s performance led to the firing of its coach, Tony Hughes, who had essentially been on the hot seat for his performance over the last two years. Hughes led the Tigers to a 9-20 record overall in his time at the helm. Last season, JSU finished 3-8 overall and 3-4 in conference play. To add to JSU’s wild season of changes, the Tigers offensive coordinator Hal Mumme resigned nearly a month ago. Mumme – who hoped to live up to the hype of an “Air Raid Offense” – failed to do so and resigned after Jackson State loss to Alabama A&M 20-16 in the 2018 W.C. Gordon Classic after the Tigers led 16-0 at halftime. Hughes replaced Mumme with Derrick McCall, a former JSU quarterback who served as the offensive coordinator in 2012 and 2013 when the Tigers averaged more than 400 yards of total offense per game. McCall has been on the coaching staff for eight years and served as co-offensive coordinator at the end of the 2017 season. Prior to the Southern game, the Tigers averaged 325.7 yards of total offense per game. With Mumme as coordinator, the Tigers averaged 310 yards of offense with a 1-2 record. Since the change to McCall as coordinator– who took over after the Alabama A&M game, the Tigers are averaging 310.3 yards per game with two wins and two losses. While the yards might not show much in difference, the wins count more and McCall will look to continue this trend after a disappointing loss to the Jaguars. But, Jackson State (3-4, 2-2) now sits in a very interesting place. With Hughes gone and Tigers’ defensive coordinator John Hendrick serving as the interim head coach, the Tigers start the final quarter of their season – a portion that will not be an easy one. Hendrick, who was in his second season as a defensive coordinator, has a diverse coaching background that includes Delaware State, Southern University, Texas A&M, Tulane, University of South Florida, South Carolina State, the NFL Fellowship Program, Temple University, Mississippi State, Arkansas Pine Bluff and Alabama State in 2015 before coming to JSU. With over 30 years of coaching and playing experience – much of his expertise comes on the defensive side of the ball – Hendrick will be thrown in the fire and put to the test Saturday afternoon when the Tigers host Prairie View A&M – a team that is coming off a 27-13 loss against Alcorn State on its homecoming and is currently tied for second in the SWAC West behind Grambling (4-4, 3-2) and Southern (5-3, 4-1). Prairie View (3-5, 2-2) will be a tough match for Jackson State as the Panthers enter Saturday’s game ranked third in total offense among SWAC opponents (448.3 yards per game), fourth in rush offense (177.8) and first in pass offense (270.5). The Panthers also rank second in kickoff return yards (23.4 ypg), third in field goals (3-of-5), fourth in first downs (21 per game) and fifth in third-down conversions, meaning the offense can extend drives and potentially keeping the Tigers’ defense on the field a lot longer. Hendrick – in his first game as interim coach – along with his staff of coordinators will have their hands full stopping the Panthers many weapons and their combination of run and pass. Surprisingly, despite the uproar and changes taking place on their coaching staff, the Tigers still have a chance to compete to represent the east in the 2018 SWAC Toyota Championship game on Dec. 1, which was recently moved from historic Legion Field in Birmingham, Alabama and will be held at the home venue of the SWAC institution with the highest ranking team that qualifies for the championship game. If Jackson State can win its last three games or win its last two games against Alabama State and Alcorn and get some help with Alabama A&M losing a division game, the Tigers could still end up playing for a championship. However, Alabama A&M’s next three games include a road game against Arkansas-Pine Bluff (SWAC West) on Saturday, at home against Grambling (SWAC West) and season finale on Nov. 17 at Rice-Totten Stadium against Mississippi Valley (SWAC East), a team that will be looking to crash any team’s dreams of landing a spot in the championship game. Alcorn goes on the road Saturday to face New Mexico State in nonconference action before going into a bye week before playing JSU in its final game of the season. Meanwhile, Alabama State has a home game against Texas Southern Saturday afternoon, then Jackson State at home, a road game against Prairie View and a Thanksgiving Day afternoon game against Mississippi Valley to end the season. In college football, there is something to say about how a team finishes in the fourth quarter, when every play, every yard and every down matter the most. Things are ‘up in the air’ for Jackson State. The season is not over yet, and the Tigers – if capable – could show that they have something to prove in this final quarter of the season.